It’s true that a grill is a must-have accessory that you should build to recharge the battery. However, you cannot build a monster outdoor grill that will be extremely hard to move around. Therefore, you have to find another one to replace this idea. 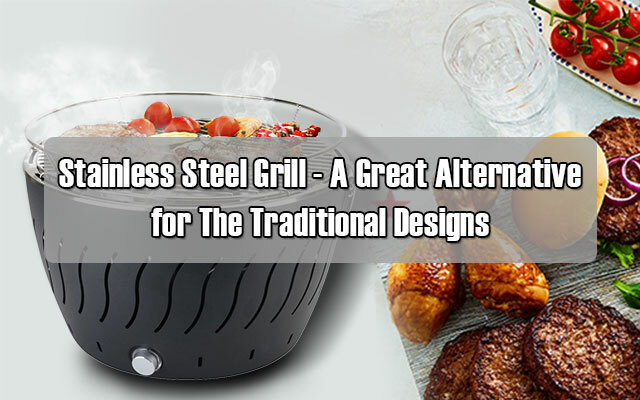 After having researched on various sources, I found that the stainless steel grill is the best alternative for the huge and bulky traditional grills. This material still guarantees for the great properties of durability and heat resistance so that you can comfortably enjoy your intense baking time. Plus, this type of grill features the higher portability and lightweight for easy transferring. With the collection below, I’m sure that you can get what you really need right now. 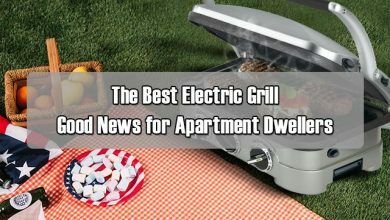 However, because this is somehow like the introduction of these grills, you won’t find some information about how to choose a right one, or some reputable brands you should consider. Therefore, to acquire that knowledge, you can consult my buying guide article. 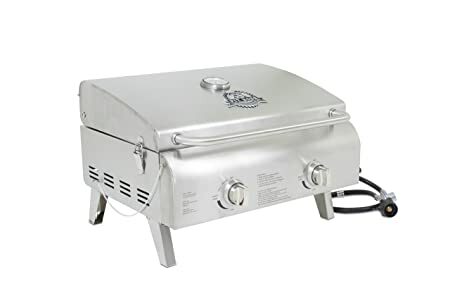 This stainless steel charcoal grill only measures 15.2”x15.1”x10.2” and weighs about 11.3 pounds, so you won’t find any difficulties bringing it along on your picnic time. 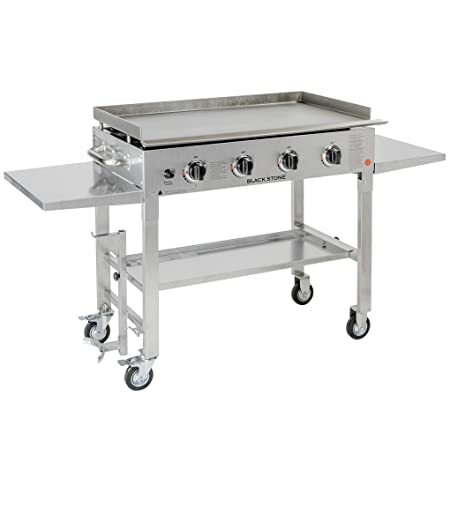 The grill can offer you with a spacious cooking surface to make over 10 servings for your crew. The spotlight of this product that takes my breath is all about the built-in fan system. At first, when seeing it perform, I definitely thought that this one had to run on electricity because there was no smoke during baking time. However, I was wrong. This one uses the charcoal to bake the food. It can be smokeless thanks to the fan that can extract the smoke at the base to prevent it from directly contacting with your foods for protecting your health. More than that, the fan is also a great help that maintain the flame of the charcoal because when it spin, an air flow will be led into the box of charcoal to keep it burning evenly. Plus, if you would like to maximize the combustion, you should break the charcoal into smaller pieces. Therefore, you can add more material in one time because to do that when baking, you have to take the wire out, which is quite difficult. The greatest point of this stainless steel grill is about the compact design. This one is perfectly stored in a case which measures 15”x7.5”x2”. Therefore, you will find extremely easy to carry around on your camp site. Plus, when you set up the whole grill, you will have the great grill with the 12”x12” grilling surface to make sure that your average starving crew will always have foods to enjoy. Besides, the grill can stand firmly in place thanks to the sturdy flat base created by the case. However, because this one is flat, you have to find a compatible countertop on your camp site. Plus, the distance between the material storage and the grilling is quite large that it’s less likely to have flare-ups and your outcomes will be baked perfectly. 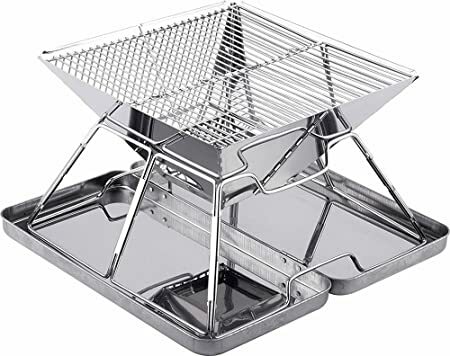 Moreover, there is also a drip tray under the material shelf in order to collect the ash of your material and the juice if available so that the countertop under the grill will be always clean. Therefore, you don’t have to concern about that. In addition, cleaning this one is not a problem at all because the whole grill is made of top-quality stainless steel with non-stick feature so that you just need to wipe some times to get it clean flawlessly. 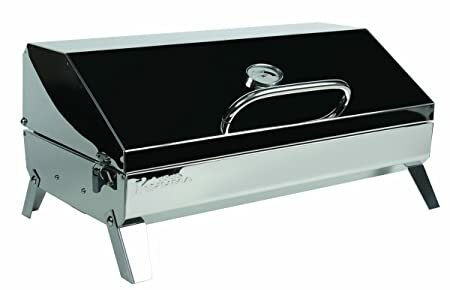 Even though this is a small stainless steel grill, it has a good size, about the size of a medium suitcase. Therefore, carrying or transferring is not a problem with this product because of the securely mounted handle that you can comfortably hold. Besides, the grilling surface can accommodate a dozen of burgers along with some hotdogs and vegetables at once. Thus, it’s less likely that there will be a lack of foods during your parties. Plus, there are two stainless steel burners which can produce up to 10000BTU so that the grill always has enough heat for a great amount of foods. Moreover, the grate is still able to carry small pieces of foods without letting them drop on the burners. You can get the tasty results with some black sear marks thanks to the grate. Plus, you don’t have to concern that the juice or food debris can drop directly on the burners, which can cover the emitters because there are two sturdy sheaths above the burners can both capture juice and make the heat concentrate. Therefore, your foods will receive heat as much as possible to get done more quickly. In addition, you can continuously keep track with your foods inside thanks to the gauge on the lid to show you the exact temp. With the gas grill, you can also get your foods with the smoky taste like the charcoal grill. You just need to put your meats on a side that doesn’t have heat and place some wood chips wrapped in a foil on the other side with the heat. Then, close the lid and wait for the smoke appearing. 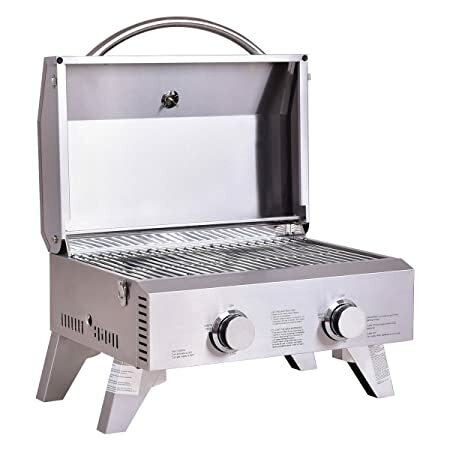 With the same design as the counterpart above, this stainless-steel BBQ grill is much more favorable because of its higher power and the greater size. This one has a 20000BTU capacity, twice as much as the above one, so you can make sure that the gill won’t have the hot and cold spot and your foods certainly receive enough heat over time. Besides, this one is larger to provide you with more space for grilling. The grate is really awesome that can carry up to 6 red meats with some chicken breasts and vegetables. When done, your foods will possibly get some black sear marks for much tastier and spicier when being enjoyed. Moreover, the whole grill is completely made of stainless steel with great durability to last for a lifetime and awesome heat resistance that you can confidently use it for bulk baking also. Plus, the stainless steel is also lightweight for easy carrying and has the non-stick characteristic to help you clean much easily. Here is the best choice of the tabletop stainless steel grill, from my owned view. Although this one also has two burners, its efficiency is outstanding. Thanks to the “U” shape instead of two burners arranged in parallel positions, the grill will take less time to get the perfect temp of preheating process, within 5 minutes only. Besides, the “U” burner can make sure that the heat will spread throughout the whole grill and be transferred evenly to the grate to bake your foods perfectly. Plus, the domed lid is also a great help in maintaining the heat flow inside the grill to get your foods done more quickly than other bad counterparts. Moreover, you must love the spacious cooking surface. The grill offers you with 205sq inches of primary baking surface and 105sq inches of warming rack so that while baking red meats and steaks downstairs, you can bake some burger buns and corns. You know that these foods mustn’t have the direct contain with heat or you have to adjust the knobs to the low level. Therefore, the warming rack right here is really awesome. In addition, there is also a detachable drip tray under the sturdy body to trap all the juice during baking process to prevent mess arising on the countertop. Plus, the four legs can be collapsed easily to narrow down the dimension of the grill and you can lock the lid securely while carrying. However, the burner doesn’t have an above sheath to prevent the juice from dropping right on it, so there sometimes may be flare-ups and you have to spend more time on cleaning process. For those who would like to build a right grill on your backyard to enjoy the true BBQ parties at weekends with your family and friends, you can check this one. The grill has up to 3 stainless still burners to produce 42000BTU in total, so there is nothing that this grill cannot bake perfectly. Besides, you will have 552sq inches of normal grilling space and 142sq inches of warming rack that in one time you can bake red meats, steaks, chicken breasts along with some burger buns and corns. Plus, there is a drip tray under the grate to capture all the juice to help you easily clean the grill after baking. Moreover, there are two foldable shelves to provide you with more space to carry some frequently-used stuff like tongs, spatula, some jars of seasoning or even some serving plates for convenient use. 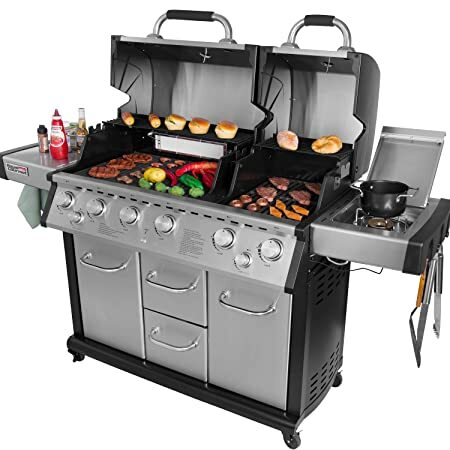 In addition, what I love about this grill is the cabinet that can contain the gas tank safely to prevent any impacts causing some undesirable problems. And now, this one the most favorable grill among the stainless steel gas grills. The grill is quite huge that can help me bring all stuff of the kitchen. The first one is one side removable shelf that you can put some stuff like jars of seasoning or even some bottles of beers. There is nothing cooler than drinking beer while baking. How American!!! Besides, on the shelf, there are up to three hooks that you can hang your tools on for convenient use. Plus, under the grill, there are two large cabinets and two drawers that you can use to store anything you want apart from one cabinet for the gas tank. Moreover, there are up to 6 burners producing up to 96000BTU to heat for both the 697sq inches of primary grilling grate and 264sq inches of warming rack. Therefore, with this huge room, I’m sure that you can easily serve for the whole neighborhood without any lack of food during the parties. Plus, the grate is divided into two zones and the larger one feature an infrared rear burner to give more heat to your foods to help it done more evenly from outer to inner, but still retain the certain amount of juice. In addition, you also have a side burner to use for making a pot of soup or some sauces to eat along with your perfectly baked meats. More than that, the two thick stainless steel lids are also the key factor to help you have the desired results. They can preserve the heat greatly without any leakages to keep your foods always in the even heat flow. You must love this product with the 4 burners producing up to 60000BTU to get your foods baked perfectly. The spotlight of this grill is about the status of the flame. I don’t know why the brand can do that, but when the burners work, there is no other flame. Therefore, my results won’t be covered with a layer of soot like other counterparts, which is much safer for the health. Besides, the grill can greatly act as a rotisserie that you can absolutely roast a huge chicken or other large meats. Plus, you will have about 513sq inches of primary grilling grate and 210sq inches of warming rack so that you can at one time bake a variety of foods to make sure that your parties won’t suffer any pauses due to the lack of servings. Moreover, there is a side burner that you can fry some eggs, sausages or making soups or sauces to eat along with your baked foods. Plus, the extra shelf is really good for placing some serving plates or jars of seasoning in order not to run into your kitchen to get some more. In addition, the huge cabinet under the grill can accommodate for a gas tank and other stuff depending on your choice. And, the grill stand on four sturdy wheels that help it easier to move around your backyard. I have to say that you will fall in love with the Japanese performance when they are cooking on a flat grilling surface. And now, you can on your owned perform like a professional in this stainless steel grill of the teppanyaki style. The grill offers you with 720sq inches of flat top grilling that you can do anything you want from making breakfast with some sandwiches, bacons, fried eggs and melted cheese also, preparing for lunch, dinner to having a truly BBQ party with your homies. With this versatile grill, you can display on the surface with a variety of foods beside the baked meats or steaks to appeal to everyone. Besides, the four burners can promise to supply a great amount of heat evenly to the flat cooking grill to make sure that your foods always receive the desired heats to get done perfectly. Plus, thanks to the flat and thin surface that the heat can be transferred more quickly to reduce much time for preheating, less than 5 minutes certainly. Moreover, the cooking surface also acts as a covering lid to prevent wind from directly affecting the flame inside to preserve the heat flow under the grilling surface. Plus, there are two side shelves and a sturdy large one under the gill so that you can comfortably put anything that you consider for frequent use. In addition, the whole product stand on 4 firm wheels that can be locked to keep the grill stay in place during baking and make it easier to move around. And, there is also a built-in holder where you can place the gas tank safely and conveniently in case you have to move the grill. 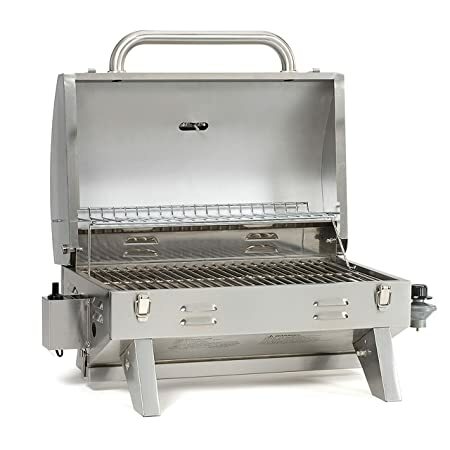 And now, with the high-end design, you will love this iowf c stainless steel grill offered by the Weber, a much reputable brand in this realm, so you won’t have any regrets afterwards. 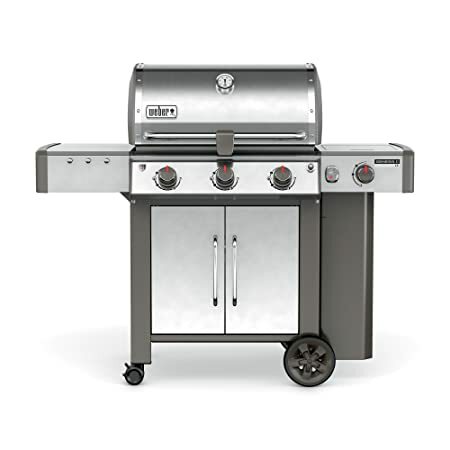 The grill offer you with a spacious primary cooking surface, about 513sq inches, and the 156sq inches of warming rack so that you can utilize the both area to bake the meats and some burger buns or corns at once. Besides, the warming rack is foldable that you can collapse to make more room for a whole huge turkey, for example. Or, you can attach a compatible tray of the Weber, bought separately, in order to bake some vegetables with the indirect contact with heat. Moreover, you will have a flexible side shelf to put some essential stuff like tongs and spatula. Plus, you can utilize the left room of the cabinet also after you placed the gas tank inside. The cabinet is a great protection of your gas tank truly because there is nothing can have impacts on your tanks to prevent the undesirable problems. In addition, there is also a gas side burner to help you make other foods like soups or sauces to make your baked foods much tastier when being eaten along with. More than that, on the side burner, there is a digital indicator that can show the amount of the left gas in the tanks so that you can continuous check for the immediate replacement. Another plus point is that the grill is also compatible with natural gas which is more favorable than the propane as some experts advise because this material is much friendlier to environment and has fewer pollutants to your burners as well. However, I found a little inconvenient with the grill while moving because there are only two wheels so that I have to lift on side of the grill. By the way, if you would like to have more choices of this brand, you can check my article on the weber grill for more worthy information. My last recommendation for your is this 316 stainless steel grill. 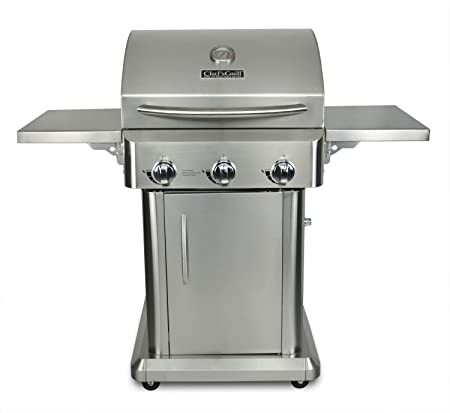 As its name, the grill offers you with 316 square inch cooking surface along with the top warming rack where you can freely grill some vegetables and corns and burger buns as well so that the party won’t suffer any pauses due to lack of servings. 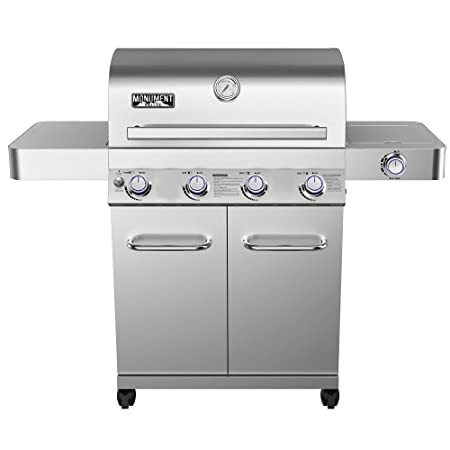 Besides, the product is completely made of high-end stainless steel which can help it build a tough and durable body to stand with the severe heat during grilling time. Therefore, you don’t need to worry about any damages caused by the heat. 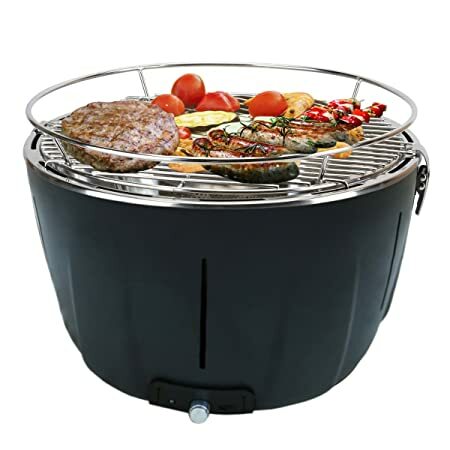 Plus, the grill features a quite thick domed lid which can help retain the heat inside the grill so that there will be a constant heat circle to make sure that the food can receive enough heat to get perfectly grilled. Moreover, the grill measures 26”x10.5”x12”, so it won’t take much space for transportable and storing. Plus, with that dimension, you can easily to hold and carry around without much effort. You can hold the handle to carry, but make sure that you had already locked the lid with the body. I addition, this one has a design of tabletop with 4 foldable feet, but you can purchase another long standing foot as well because this one is also designed to connect with the standing foot. 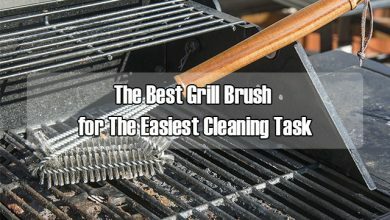 Bonus: How to clean a stainless steel grill? 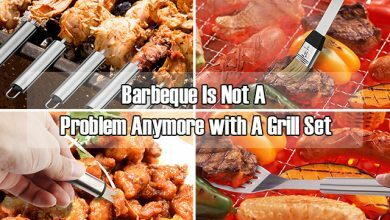 Firstly, like other types of grill, you have to use a grill brush to eliminate all the grease and food debris sticking to the grate. Then, cleaning the emitter is very important, so you have to check every single hole to make sure that there is nothing covering the holes. After that, you can spray on the grate and the emitter with a layer of oil like canola or peanut oil to create a protective shield to prevent the severe damage of the intense heat of the grill. Moreover, this stainless steel grill requires a high maintenance for the body or the outside of your grill. I highly suggest cleaning it every two weeks even though you don’t use the grill. You have to use the non-toxic, non-abrasive cleaner formulated for the stainless steel to help it get the polished appearance over time. Don’t only clean or pray water on the grill because it will cause some spots on your grill which discolors it. Plus, to maintain the excellent condition of your grill, you shouldn’t place the grill neat the pool because the chemicals of the water will cause more rust on the surface you’re your grill. 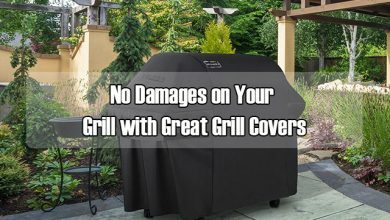 In addition, you should spend money on a great cover to protect your grill from any impacts of the surroundings. From the bottom of my hearts, I really appreciate your goodwill when you read my dedicated work from top to toe. I hope that among my recommendations, you can find the most suitable stainless-steel grill for your backyard to get your BBQ parties started every weekend. By the way, I wish that you can continue supporting my site to help it better.